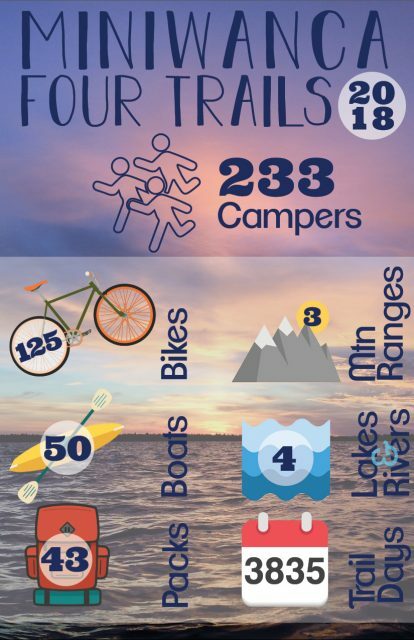 As all of the campers, parents, and leaders begin to settle back into their homes and things quiet down from the summer, I’m left reflecting on what an incredible summer it’s been for Four Trails. Nearly 12 weeks ago, trip leaders began arriving at Miniwanca for training. Campers arrived a month later, and for six weeks they traveled with their leaders all around Michigan, Canada, and New England. They backpacked, canoed, cycled, and kayaked around and through some of the most beautiful scenery in America, and more importantly, they did it all as a way to develop their own mental, physical, social, and spiritual strength. Anita Desai tells us that wherever you go becomes a part of you somehow. Campers and leaders of the Four Trails program, I hope that the roads, trails, mountains, lakes, and rivers that became your home this summer will also become a part of who you are. You pushed yourselves farther than you ever imagined and when you hit the point when you felt you could not go on, you did go on. Those experiences of pushing through your limitations will help you again and again as you encounter challenges throughout all aspects of your life, and when your goals appear impossible to achieve, I hope this summer can remind you of your own power. What you have done cannot truly be measured in distance or in days, but only in the impact you will have as you return to your home communities. We’re incredibly grateful for the amazing mobile communities you were able to create this summer, and we’re already looking forward to an incredible summer 2019. Hope to see you then!